John Henson has averaged 12.4 points, 8.0 rebounds and 2.3 blocks per game this season for Milwaukee. MILWAUKEE — It didn’t take long for the Milwaukee Bucks to go from feeling good about having 13 healthy bodies to again worrying about an injury to a key player. Bucks center John Henson missed Saturday’s 117-95 loss to Minnesota after having an MRI on his lower left leg earlier in the day. 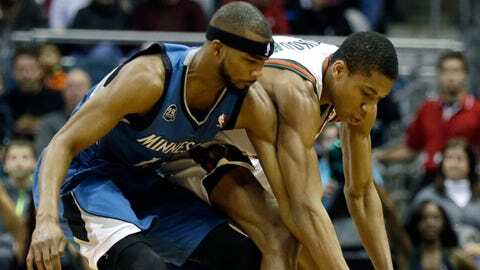 Henson said he will learn more about the injury after consulting with team doctor Michael Gordon in the near future. He acknowledged staying back when the Bucks travel to Los Angeles on Monday is an option. "That’s what we’re going to figure out," Henson said. "Even if I have to stay back and get treatment and see if I can make it to Utah or Phoenix, we’ll just see and figure it out." Henson, who turned 23 years old Saturday, got tangled up and tripped over Cavaliers center Anderson Varejao late in Milwaukee’s overtime loss to Cleveland on Dec. 20 and didn’t play the following day against Philadelphia. He returned to score 14 points with nine rebounds and six blocks against Charlotte last Monday, but was able to play just 20 minutes in Brooklyn on Friday. "I tried to play through it and I was making it worse and it wasn’t getting any better," Henson said. "Just playing on it and running around, I shouldn’t have been doing that." One of Milwaukee’s bright spots in a dreary season, Henson has averaged 12.4 points, 8.0 rebounds and 2.3 blocks per game. An injury of any extended period of time would be a particularly tough blow to the Bucks. While discouraged with the setback, Henson didn’t seem too concerned about the severity of the injury. "I’m young so I’m a quick healer," Henson said. "So hopefully it won’t be too long." Mbah a Moute returns: This probably wasn’t the date Luc Mbah a Moute had circled on his calendar for his first trip back to Milwaukee. After five seasons with the Bucks, Mbah a Moute was traded to Sacramento in July. Milwaukee’s second-round pick in 2008 played just nine games with the Kings before he was shipped to Minnesota for Derrick Williams on Nov. 26. Mbah a Moute received a nice hand from the crowd at the BMO Harris Bradley Center when he checked into the game and finished with eight points and eight rebounds in 15 minutes. "It was cool," Mbah a Moute said of his return. "I felt a little weird being on the other side, but it was cool. A lot of those guys are new guys so I didn’t play with them, except for a couple of guys. I think it would have been different if they would have had all the guys I played with. "It just felt different. It felt good, too, because obviously I played here for many years." Mbah a Moute quickly established himself as a rotation player with the Bucks and grew into the role as the team’s primary defensive stopper. He averaged 6.9 points and 5.3 rebounds in 335 games over five seasons in Milwaukee. Timberwolves coach Rick Adelman said it has been tough for Mbah a Moute to settle in with Minnesota because the team has been on the road so much since he was acquired. "I think these next couple of weeks he is going to get a lot better and we are going to have a better understanding, but he is a very good defender," Adelman said. "He is one of the best perimeter defenders we have, by far. Now we are just trying to figure out how to use him on the other end." Mbah a Moute is averaging 4.1 points and 3.4 rebounds in 18.3 minutes per game since joining Minnesota, the least amount of playing time he’s received in his career. "I’m just trying to get in where I can, I guess," Mbah a Moute said. "The way the season is going for me, sometimes I play, sometimes I don’t. Sometimes I score, sometimes I don’t. I’m just trying to work my minutes and take advantage of the time I get." Ilyasova’s slump continues: Bucks power forward Ersan Ilyasova has gone through cold stretches in his career before, but it’s hard to remember a run worse than the one he’s currently on. His 2-for-10 shooting performance Saturday made him 10 of his last 56 (17.9 percent) from the field over his last six games. Ilyasova hasn’t shot over 50 percent in a game since Dec. 3 in Boston. Ilyasova, who finished fourth in the NBA in 3-point percentage at 44.4 percent last season, is shooting just 18.2 percent (8-of-44) from beyond the arc this season, including missing his last 15 and 23 of his last 24. "It’s just something he’s going to work through," Bucks coach Larry Drew said. "Shooters have a shooters mentality. They feel they will maybe miss three or four, but they will come back and make the next five in a row. He has to get into that mindset of just letting it go. I think right now he’s starting to aim it, but I’m confident he’ll get out of it." When he took him out in the third quarter, Drew encouraged Ilyasova to keep shooting. The Bucks coach feels aiming shots is mostly mental. "I think what happens when guys are not shooting the basketball well, they are a little bit slower into shooting," Drew said. "That’s kind of a tendency when you are not making shots. You want to make sure everything is perfect — your feet are lined up, the elbow is in, the head is up, the release is there — instead of just doing it all in one motion."